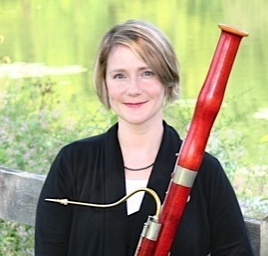 Monica Schwartz is a bassoonist, composer, and music educator. Monica attended the Peabody Conservatory of The Johns Hopkins University and earned three undergraduate music degrees in Bassoon Performance, Music Education, and Composition (2001) with a minor in Jazz Voice and two masters in Music Composition and Education (2014) also at Peabody. She has studied bassoon with Linda Harwell (National Symphony) as an undergraduate, Terry Ewell (Towson University), Truman Harris (National Symphony Summer Music Program), and Barrick Stees (Cleveland Orchestra while attending Interlochen). Monica owns and operates Orchard Music, a studio for private lesson teachers. She teaches there five days a week bassoon students of all ages and experiences. Monica also is bassoon faculty for the Peabody Preparatory and has taught private lessons and theory classes there since 2010. An avid performer, Monica regularly freelances with local orchestras and enjoys performing chamber music. Her current chamber group, Venteux (translation “Windy”) performs recitals in the Maryland and DC area. In the past, she was principal bassoonist with the Columbia Orchestra (2007-2012) and Londontowne Symphony. In 2009 she appeared as featured soloist with the Columbia Orchestra and also performed the Rite of Spring in their promotional video and in concert. Monica also was the founding member of the Columbia Chamber Winds and Gallery Winds wind quintets. These groups performed in several recitals annually. In 2013 and 2014, she spearheaded the Gallery Winds chamber music camp working with talented young students to learn wind quintet works. While completing her undergraduate and masters degree she enjoyed playing principal bassoon with the Peabody Wind Ensemble as well as new music ensemble the Camerata and Peabody Symphony and Opera Orchestras. She can be heard on the Peabody Wind Ensemble recording Orff, Bird and Reed (Naxos 8.570242). Also a composer, her works have been featured locally and abroad. Her chamber opera, Wings of Fire, was produced by the Peabody Opera Department. A recital of her works for bassoon were performed at the International Double Reed Society Convention in Tempe, Arizona. In 2008 she presented a complete recital of her works at Peabody. She has studied composition with Thomas Benjamin, Nicolas Maw, Moris Cotel, and Mark Lanz Weiser. Monica was a band director in Howard County Public Schools (Maryland) for 12 years and was twice nominated for Music Teacher of the Year for Howard County. Her philosophy of classroom teaching worked on creating communities of young musicians, encouraging a musical performance culture infused in everyday of school life. She organized many experiences for her students such as a day with with Lynn Klock (Saxophonist with UMASS), Low Brass evening with the Peabody Trombone Choir (a concert and play a long), school day performances at the Inner Harbor in Baltimore, annual student chamber music concerts with ice cream social, Jazz Band, in addition to the traditional instrumental music experiences. She has also given back to the community of musicians by serving as board member for the Columbia Orchestra and donating her time to adjudicate Maryland All-State Auditions. As a jazz vocalist and clarinetist, Monica has also been a lead singer with Blue Sky 5 (jazz) and The Main Street Southern Jazz Band (dixieland). Her first album with Blue Sky 5 sold thousands copies. She has also performed several times with Ed Myers jazz trio at Asean Bistro in Columbia and the Jazz Messengers of Columbia.